Survivor: The Australian Outback Card Game is a card game from 2000 for 3 to 8 players, and is pretty obviously a rushed attempt to cash-in on the hugely successful reality show while it was still at its peak. The object of the game is not surprisingly to become the Sole Survivor. You can help your own case by winning immunity for a round by collecting a certain amount of survival item cards, otherwise you will have to try to convince your opponents to spare you from being voted off. When only two players remain, the “jury members” vote for the Sole Survivor and winner of the game. 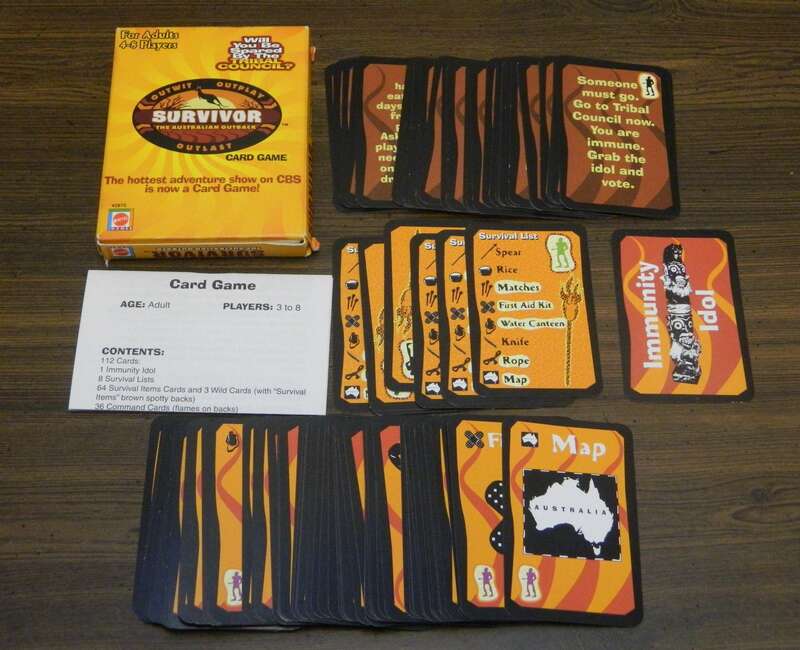 To start Survivor: The Australian Outback Card Game, separate the two decks of cards (the ones with spots on their backs are survival item cards while the ones with flames are command cards). Shuffle each deck separately and deal four survival item cards to each player (who then place them into their hand). 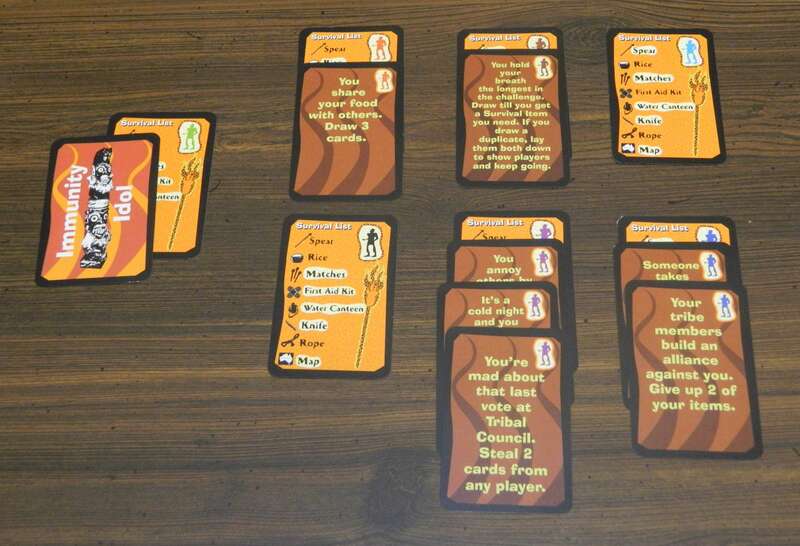 The remaining survival item cards are placed face down in the middle of the table to serve as a draw pile (as are the command cards in a separate pile nearby). All players then draw a survival list card and lay it face up in front of them. The survival list card determines which items each player needs to collect to win immunity (the highlighted items are the ones the player is looking for and each player should have a different list of items needed). The amount of items needed varies depending on the amount of players still in the game. If there are five or more players remaining, you need to get all five of the highlighted survival items. Four players left drops the requirement down to any four (and not surprisingly the last three players only need to get three items). Since this player has gathered all five items on their survival list, they win Immunity and are safe from the vote. Survivor: The Australian Outback Card Game begins with the youngest player. Every turn in the game is the exact same, the current player draws a command card, reads it to all players, does what it says, then places the card in the discard pile. Most of the cards involve card trading, stealing, discarding someone’s cards or your own, or drawing (or picking someone else to draw) but there are some oddball ones as well (some of which are a little OP). One card lets you keep drawing cards (and since it doesn’t say otherwise, we assumed it meant you got to keep every card you draw) until you get a survival item you need. Another punishes a player for “skinny dipping” by forcing them to play with their hand face up for the whole round. Unless that player gets extremely lucky in their card drawing, they are not going to win immunity this round because everybody knows how close they are to winning it and will cannibalize their hand. Finally, one card in the command card deck forces the start of Tribal Council and the player who drew it gets immunity (apparently being extremely lucky with card drawing is worthy of Immunity in this version of Survivor). Here are some of the possible command cards you can draw in the game. Play continues clockwise until one of two things happen. First, when one player gets the required amount of survival items on their list, that person takes the Immunity Idol card and it is now time for Tribal Council. The other way play can stop is if someone draws the command card that starts Tribal Council. When one of these two things happen, one player will be voted out of the game. The player with the Immunity Idol is safe for this round and cannot be voted for and they also get to start the voting. To vote, find a command card with the colored icon that matches the player you wish to vote for (their color is indicated on their survival list card) and place it face down on the table. After all players have voted, the immune player reads the votes one by one and the player with the most votes is out of the game. If the vote is tied, the Immunity Idol holder gets to break the tie between the tied players. This is an example of how voting goes in the game. Since the green player is immune, nobody can vote for them. In this Tribal Council, four different players received votes. Since the purple player got the most votes (three), they are eliminated from the game. All other players survive this Tribal Council. 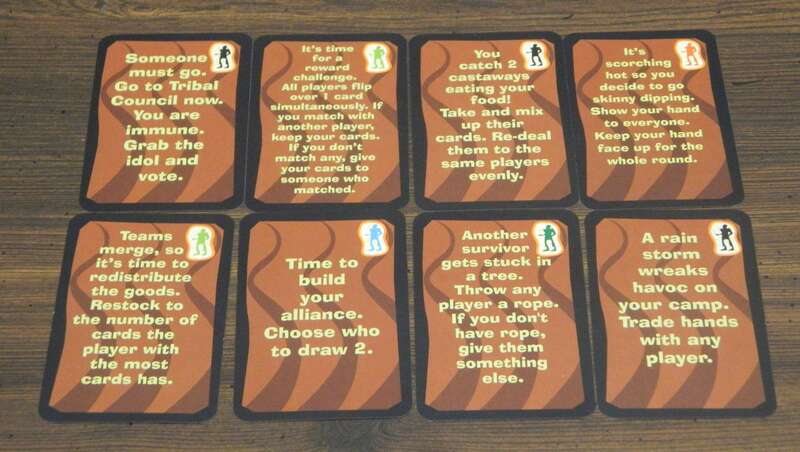 Once voting is complete, the voted off player returns their survival item cards to the bottom of the draw pile (the Immunity Idol winner also returns all of their survival item cards to the bottom and draws four new cards). All other players get to keep their survival item cards from the previous round (and they very well could get the next immunity instantly if the amount of remaining players dropped down to four or three and they already have those many cards that they need). A new round then begins and play continues clockwise in the exact same way until another Tribal Council starts. When there are only two players left in Survivor: The Australian Outback Card Game, the Final Tribal Council begins. All players return to cast their vote for the Sole Survivor (winner) of the game. The player who gets the most votes wins the game. If there is a tie in the Final Tribal Council vote, you will “go to rocks” aka draw command cards until the colored icon matches one of the two finalists (and that player is the winner). While I no longer watch much reality television, Survivor is one of the few shows I have stuck with and I still watch it to this day. It is a legitimately good show in a sea of awful and scripted “reality” series that have pretty much overrun television. However, even though I am a fan of the show, Survivor: The Australian Outback Card Game is a terrible game that I will never play again. It is definitely one of the worst games we have reviewed on Geeky Hobbies and I would not recommend it to any type of gamer. First of all, other than the name, Survivor: The Australian Outback Card Game shares almost nothing in common with the TV show. Survivor requires great social skills, a strategic mind, and usually a decent amount of athleticism. This game requires pretty much none of those things. You rarely even have to make a decision of any significance. You just simply draw a card, do what it says, discard it, and hope to gather enough of your required items to win immunity. There are no challenges (other than a couple cards that allude to them), no real strategy, and Survivor is never going to give a player immunity for collecting a certain amount of resources or for their great card drawing luck. It is even very possible for the Final Tribal Council to be determined by “drawing rocks” (like it was in our game), which would never happen in the actual show. 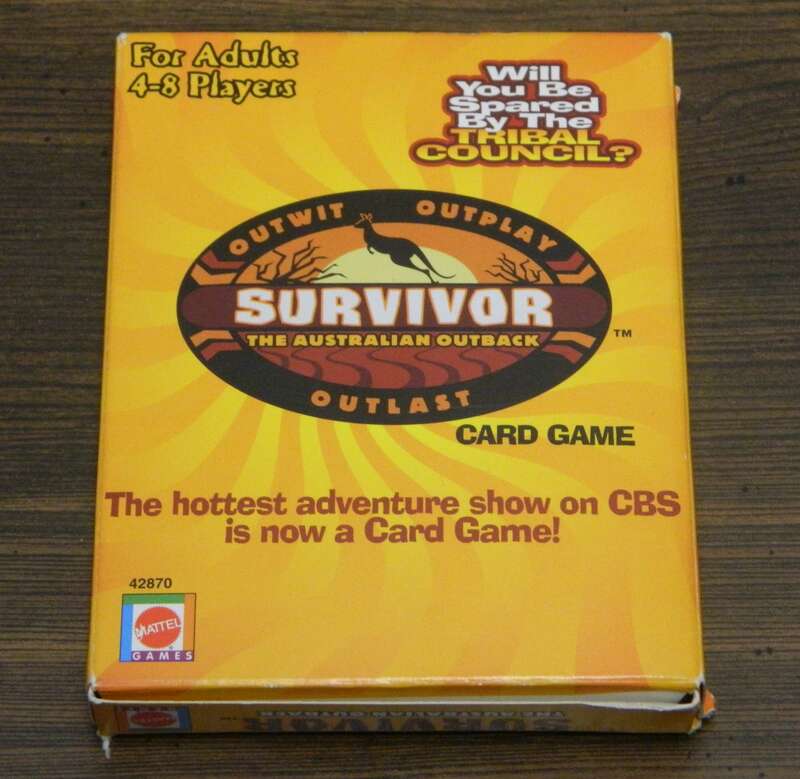 The worst thing about Survivor: The Australian Outback Card Game is that Survivor is a ripe concept to be turned into an amazing and strategic party game but none of the games based on the franchise even come close to the greatness of the show. The only other Survivor game I’ve played was the 2005 game (which is decent) but I can’t imagine any of the other games I haven’t played being as bad as this one. One sign that tipped me off about how bad Survivor: The Australian Outback Card Game was going to be was that the rules actually say “You may have a question that is not answered in these rules, so it’s up to you to decide how to play.” That is an actual quote from the rules. Either the game developer was lazy or this game was extremely rushed. You know a game is rushed and poorly made when they ask you to fill in the gaps of their rules. The basic rules of the game are fine, however the game does a poor job of explaining what each card is supposed to do. We had no idea if “steal” means pick random cards or if it was the thief’s or the other player’s choice (we split the difference and made it random selection because it could be overpowered otherwise). There are also a few other cards where you will have to make up your own solutions. 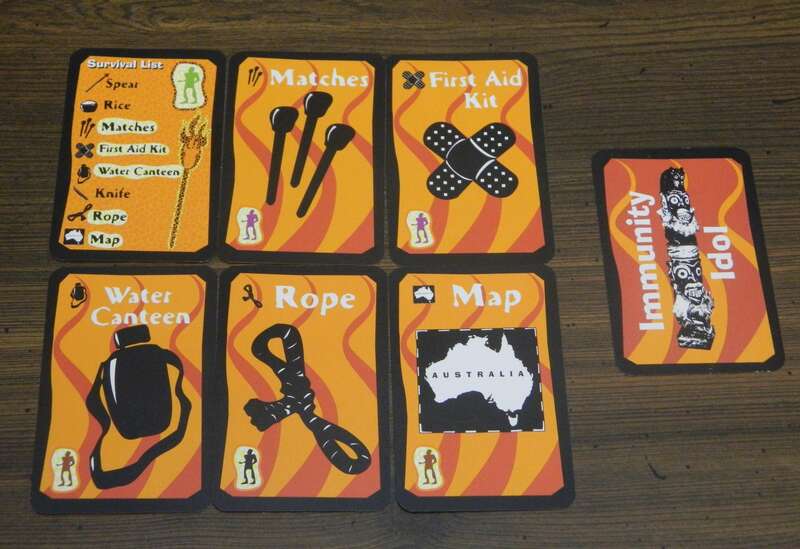 Also, winning Survivor: The Australian Outback Card Game pretty much completely comes down to card draw luck. Most of the cards are pretty much pointless, many of which involve trading cards you don’t need for (most likely) different cards you don’t need. Even though most of the cards that involve trading talk about building an alliance, nobody is going to hand over items the other player needs (unless their only other cards are ones they need for Immunity). Except in certain situations, cards involving trading are pretty much pointless and a waste of time. The only cards that are usually useful are a couple overpowered cards that I mentioned earlier in the rules section (especially the go to Tribal Council and win Immunity card) and ones that let you draw cards from the deck. Also, hardly any of the cards give you a strategic decision to make. It is usually pretty obvious who you should target with harmful cards (players who haven’t won Immunity yet and thus have stronger hands and also players with a lot of cards), so you barely even have a decision to make on those. On top of all this, a lot of the cards force you to hurt players who could very well soon try to vote you out of the game. You have no choice in the matter, you have to do what it says on the card so if you get a harmful card you need to hurt somebody and possibly lose their vote. Oddly enough, if you have too much card draw luck and get to make too many “big moves” (because of the cards you draw), you will actually probably be the underdog in Final Tribal Council if you even get that far (since you will probably have angered several of the other players). If you are fortunate enough to get a chance to play strategically like Richard Hatch (again you have to be dealt the right cards in order to even be able to do so), you probably aren’t going to win. In Survivor: The Australian Outback Card Game you are going to get a lot more under-the-radar winners than the good strategists that usually win the real show. The game also has a pretty bad rule that in some situations can make it bad to win Immunity early in the game or have a lot of cards in your hand. Because the Immunity winner and the player voted off are the only players that lose their cards at the end of the round, the Immunity winner from the previous round is at a huge disadvantage in the next round. Somebody else could very easily win immunity before the previous holder even gets a chance to take a turn in the round. Also, a lot of players will just vote out whoever they think is closest to getting Immunity in the next round (especially if that person was unlucky enough to draw the skinny dipping card which exposes their hand for the entire round) to give themselves a better chance at Immunity. Survivor: The Australian Outback Card Game is a bad game anyway, but letting players who don’t win Immunity or get voted off keep their cards is one of the worst game rules I have ever seen and hurts the game even more. We played with just four players and I will admit that playing with the maximum of eight players would make Survivor: The Australian Outback Card Game a slight bit better. When you play with six to eight players at least you have a few more choices to make and more voting options (and I could see some short-term alliances actually forming in bigger games). However, since you vote people off this is probably not the best game to play with family. Children might love getting a chance to vote off their parents but adults will probably have to choose between their children (either which one to vote off or which one to vote for in the Final Tribal Council). While I doubt most people will care that much about winning a horrible card game, feelings could get hurt especially if you are playing the game with children. I love Survivor (I have seen all 472 episodes that have aired at the time I wrote this review) but I absolutely hate this game. I got this game within a year or so after it was released (so I have had it for at least 15 years) and had never played it until now. I think my copy of Survivor: The Australian Outback Card Game would have been better off not ever being played, it is that bad of a game. The game currently has a whopping 3.27 rating (out of 10) on Board Game Geek and I actually think that is a bit high. I apologize in advance for the lame joke but Survivor: The Australian Outback Card Game is a game that should definitely be voted off the island (or in this case out of existence). Playing with six to eight players makes the game slightly better. Rules aren't explained completely and you will have to interpret some of them yourself. The game doesn't really play much like Survivor at all. There are no challenges, pretty much no strategy, and the game pretty much comes down to luck. Every turn is simply: draw card, do what it says, and then discard it.